What do we know about this shadowy figure who is depicted in snapshots in more than twenty gospels and gospel fragments that have survived from antiquity? So it will be informative and in the interests of being honest to historical enquiry to take careful note of exactly what are these “assorted facts” about Jesus that Robert Funk lists, and their actual sources. It will also be instructive to compare the reasons for accepting some data as “facts” with those used for rejecting others as “fictional embellishments”. No one I know of has ever argued (and I certainly don’t) that someone made up a story about recent real historical events and invented persons, and that significant numbers of people (who could have known better) began to believe in this newly constructed history of the recent past. (b) a work of the Jewish scholar, Jon D. Levenson, The Death and Resurrection of the Beloved Son. I have made available the general outline of his arguments in a series of posts here. One of my most accessed posts is from this archive, and titled, Jesus Displaces Isaac: midrashic creation of the biblical Jesus (6). Levenson provides the evidence and reasons for believing that the Christian narrative of the atoning and saving death and resurrection of the Beloved (Only) Son was borrowed from late Second Temple Jewish midrashic interpretations of their scriptures about Isaac, Joseph and others. While the cosmic significance of this event is attributed to Jewish apocalyptic, the story itself is a natural evolution or mutation of a Jewish idea that had been on the burner for some time. It is not a huge leap to merge known Jewish precedents relating to Isaac with Son of Man concepts from Daniel in the post-70 trauma of the Jews. This synopsis of a caveat is still an oversimplification. A full explanation has been made many times elsewhere and I can reserve my own take for another post. The words in parentheses are Funk’s own qualifications. Bold font indicates “facts” listed without qualification. “Substantial evidence”? I submit that each one of the above “assorted facts” is taken ultimately from one of the theological narratives of the canonical gospels. This is nothing more than a presumption that some bare bones of the gospel narratives can be considered historical fact. We are given no reason for thinking why any of this narrative should be thought anything more than fictional. I submit that the “substantial evidence”, if this is it, is a faith-based presumption about the nature of the canonical gospels. It is not of the same order as “Caesar crossed the Rubicon”. Real historical facts derive from sources deemed trustworthy as conveying, shaded in varying hues, something historical in nature. Such sources are coins, public monuments, biographies, personal letters and histories. Some additional isolated facts can be gleaned from the surviving records. These are data that a disinterested, neutral observer could have attested. “Surviving records”? Funk makes theological narratives full of the miraculous and midrashic retellings of older biblical stories sound like births and deaths registers or police records of interviews. Recall “cultivating ambiguity”. . .
Adam had a wife and sons, and we know their names, Noah had sons, Moses had followers, even God and Zeus have followers in the literature. The fact of followers in a literary narrative, and names assigned to them, may well be the sorts of details a neutral observer could attest if they were historical facts. But to assume that this estalishes that the details are historical is begging the question. It is circular reasoning. The critical methods used by “critical scholars” are not used consistently. This surely indicates that there is something else that is needed to maintain the justification for their scholarly interest. Ironically Funk himself hits the nail on the head in a savage critique of biblical scholarship (pp. 54-56) but fails to see in this instance his own failings. Scholars can see no reason why the Jesus movement would have invented details like Nazareth being his hometown, like appearing in Galilee, like having a family? Then they have missed Matthew’s gospel giving readers very good theological reasons for making up some of these things. The same Matthew also finds Galilee as a perfect setting for enabling Jesus to fulfil the prophecy of Isaiah 9:1-2 — Matt. 4:13-16. The assignment of names and the particularization of place enhance verisimilitude in fiction. Sherlock Holmes and Dr. Watson are taken by millions to have had real existence, and 221B Baker Street is an actual address in London that tourists can go and see for themselves. Robin Hood and the Sheriff of Nottingham exist for many as certainly as do King Arthur, Guinevere, and Lancelot. If “critical scholars” can reject the historicity of the likes of blind Bartimaeus, Jairus the synogogue official, Barabbas, Simon of Cyrene and Alexander and Rufus on grounds of theological interest or fictional verisimilitude, then consistency would require them to do the same for both the fact and names of Jesus’ family, and the Nazareth and Galilee “particularizations of place”. — At least they need to address the theological interests clearly visible as their underlays. This statement implies the gospels originated as a dead straight factual historical or official report of Jesus that somewhere along the line some scribes were tempted to colour with a bit of a stretch here and there. He makes this remark in direct reference to stories sometimes used as evidence that Jesus was literate, such as his writing in the dirt at the Woman Caught in Adultery scene. The statement is nothing more than a truism. It smokescreens the fact that the source of evidence is derived from documents whose provenance is unknown, and whose theological interests and fictional embellishments are all too obvious. I cannot imagine historians in other (nonbiblical) fields relying so heavily for “evidence” on documents of unknown provenance. Why not? We once again encounter the fallacy of the argument from incredulity, referred to above. Scholars well know that Mark’s view of the nature of Jesus is not quite “orthodox”. The “adoptionist” character of his opening baptism scene is widely commented on. I can see no reason for such a Christian apologist, particularly one of an adoptionist persuasion, being embarrassed about manufacturing a baptism scene for Jesus. The Spirit of God that made Jesus the Son of God is said to have entered Jesus after his baptism. Besides, any story of Jesus had to begin with a prior announcement by Elijah, as per the Malachi prophecy. To fulfil prophecy a story of a coming deity had to begin with an introduction by a lesser mortal or angelic figure. The Iliad opens with the greater hero, Achilles, half man and half divine, being over-ruled and humiliated publicly by a mortal and character-flawed king, Agamemnon. Such a scene is “not likely to have been invented by Homeric apologists”? Ah yes, but that is how the plot gets going. Well, the same with the gospels. It is the baptism of Jesus that is at the end of the gospel brought in as testimony to his authority. The event is recalled repeatedly each time Elijah makes an appearance, and the career of John is a foil for that of Jesus. The baptism itself, given its Pauline meaning, is a metaphor for death and resurrection, and with the crucifixion and resurrection forms a neat bookend set for the gospel. And in Mark it appears only the “man” Jesus is baptized, while the Son or Spirit of God enters him after his baptism. If all this is the correct way to read Mark, then we would expect later more “orthodox” gospel authors to be embarrassed by the account and to downplay it. And that is exactly what we do find. Matthew has John apologize for baptizing Jesus, Luke sidesteps the scene, and John leaves no place for a baptism at all. So say the gospel narratives. All of Funk’s supporting footnotes in this section of Honest to Jesus direct the reader to Mark, Matthew and Luke. I’m well aware of the tool of source criticism to attempt to get behind the gospel narratives. The answers that this tool delivers may enable us to glean prior sources, but that is not the same as establishing the provenance of those sources, let alone their historicity. It seems to me that the base criterion used for “establishing bedrock historicity” is deciding what the plot or characterization cannot do without and still survive as a basic plot or characterization. If so, that is not establishing historicity. It is only establishing plot and character essentials in a tale that has a lot more in common with those of Elijah and Moses than those with Caesar and Alexander. Mark, the earliest of our canonical gospels, does not simply omit the details about Jesus before his baptism, but indirectly informs readers that nothing like the birth and boyhood stories we read in the gospels of Matthew and Luke could possibly have happened. Mark is clear: Jesus was a nobody until the day he was baptized by John. He did not spend is youth travelling to the British Isles. He did not astonish his family or neighbours by turning clay birds into living sparrows or miraculously extending timber beams to help his father’s carpentry business. His birth was not marked by angelic visits to shepherds in the countryside or rich foreign elites paying his parents a visit. No one knew about angels or pious elderly folk at the Temple making public pronouncements about his destiny. He at no time as a boy demonstrated to the learned men of the cloth any astonishing wisdom. He was just an ordinary bloke like everyone else. And when his friends heard of it, they went out to lay hold on him: for they said, He is beside himself. . . . There came then his brethren and his mother, and, standing without, sent unto him, calling him. And the multitude sat about him, and they said unto him, Behold, thy mother and thy brethren without seek for thee. And he went out from thence, and came into his own country; . . . .
And when the sabbath day was come, he began to teach in the synagogue: and many hearing him were astonished, saying, From whence hath this man these things? and what wisdom is this which is given unto him, that even such mighty works are wrought by his hands? Is not this the carpenter, the son of Mary, the brother of James, and Joses, and of Juda, and Simon? and are not his sisters here with us? And they were offended at him. So Who Is This Really? But of course this raises another question about the nature of Jesus in the gospels, or at least in the earliest gospel. The question of “Who Is This?” permeates Mark’s gospel. Jesus’ is introduced in Mark’s gospel in a secret scene known only to God and the readers. No other characters in the story know anything about the Holy Spirit falling into Jesus (not “upon” him, as in Matthew) and driving him into the wilderness, and certainly none hears the voice from heaven pronouncing his identity. The only characters in Mark’s gospel who know who Jesus really is are God and the demons. Only Jesus (and the reader) sees the heavens parting and only Jesus hears the voice (Mark 1:9-11). His public entrance comes only after the curtain falls on John’s opening act. From then on people begin to ask, Who and what is this? People begin to talk about him far and wide. And ditto throughout chapters 2, 3, 5, 6 . . . .
Revised: added Self-Opening Doors and P.S. In the following I am not suggesting that the gospel resurrection appearance scenes were directly borrowed from ancient sources. Rather, that when we read of similar scenes in pagan literature we can recognize them as patently mythical. This is Robert M. Price‘s argument (Deconstructing Jesus, p.39), although Charles H. Talbert argues (What is a Gospel? The Genre of the Canonical Gospels, p. 43) that the late sources for many of the following are known to have been drawing on much earlier (pre-Christian) narratives which, by implication, can be viewed as influencing the gospel authors. Influence does not necessarily mean direct literary borrowing: by definition no-one can evade the narratives of their culture. Jonathan Z. Smith‘s modern analyses of ancient myths notwithstanding, Justin Martyr in the second century (First Apology, ch.21) acknowledged that contemporary audiences could not avoid observing similarities between the gospel narratives and pagan tales of the likes of Asclepius and Heracles. In some circles it is not politically correct to link gospel material with pagan memes. Some scholars (e.g. Ben Witherington) even link such arguments to late-nineteenth and early twentieth century anti-semitism. Ironically, there is another argument that links the current scholarly quest to explore the Jewishness of Jesus with a rebound against post-World War 2 anti-semitism and, in particular, with the West’s love affair with Israel since 1967 (e.g. James G. Crossley, Jesus in an Age of Terror). So with cannon to the right, cannon to the left, I’ll charge into the valley . . .
One scholar (name escapes me at the moment) has noted Mark’s use of the tomb as a metaphor for the Temple in Isaiah 22:16, which would enhance the resonance of this ‘door’ detail between the Apollonius and Jesus story in Mark’s gospel. Price also notes the way the chorus of maidens in the Apollonius story has a counterpart in the young man at the tomb in Mark’s gospel. Both announce what has become of the one for whom the doors were sealed and opened. For Heraclides, relating the story about the dead woman, how Empedocles got great glory from sending away a dead woman restored to life, says that he celebrated a sacrifice in the field of Pisianax, and that some of his friends were invited, among whom was Pausanias. And then, after the banquet, they lay down, some going a little way off, and some lying under the trees close by in the field, and some wherever they happened to choose. But Empedocles himself remained in the place where he had been sitting. But when day broke, and they arose, he alone was not found. And when he was sought for, and the servants were examined and said that they did not know, one of them said, that at midnight he had heard a loud voice calling Empedocles; and that then he himself rose up and saw a great light from heaven, but nothing else. And as they were all amazed at what had taken place, Pausanias descended and sent some people to look for him; but afterwards he was commanded not to busy himself about the matter, as he was informed that what had happened was deserving of thankfulness, and that they behoved to sacrifice to Empedocles as to one who had become a God. Heracles, having abandoned hope for himself, ascended the pyre and asked each one who came up to him to put torch to the pyre. And when no one had the courage to obey him Philoctetes alone was prevailed upon; and he, having received in return for his compliance the gift of the bow and arrows of Heracles, lighted the pyre. And immediately lightning also fell from the heavens and the pyre was wholly consumed. After this, when the companions of Iolaüs came to gather up the bones of Heracles and found not a single bone anywhere, they assumed that, in accordance with the words of the oracle, he had passed from among men into the company of the gods. Consequently among the inhabitants of Sicily, as men say, Aristaeus received especial honour as a god, in particular by those who harvested the fruit of the olive-tree. And finally, as the myths relate, he visited Dionysus in Thrace and was initiated into his secret rites, and during his stay in the company of the god he learned from him much useful knowledge. And after dwelling some time in the neighbourhood of Mount Haemus he never was seen again of men, and became the recipient of immortal honours not only among the barbarians of that region but among the Greeks as well. Others think that it was neither in the temple of Vulcan nor when the senators alone were present that he disappeared, but that he was holding an assembly of the people outside the city near the so called Goat’s Marsh, when suddenly strange and unaccountable disorders with incredible changes filled the air; the light of the sun failed, and night came down upon them, not with peace and quiet, but with awful peals of thunder and furious blasts driving rain from every quarter, during which the multitude dispersed and fled, but the nobles gathered closely together; and when the storm had ceased, and the sun shone out, and the multitude, now gathered together again in the same place as before, anxiously sought for their king, the nobles would not suffer them to inquire into his disappearance nor busy themselves about it, but exhorted them all to honour and revere Romulus, since he had been caught up into heaven, and was to be a benevolent god for them instead of a good king. The multitude, accordingly, believing this and rejoicing in it, went away to worship him with good hopes of his favour; but there were some, it is said, who tested the matter in a bitter and hostile spirit, and confounded the patricians with the accusation of imposing a silly tale upon the people, and of being themselves the murderers of the king. Not every good person was turned into a god. Alcmene was turned to a stone, but to Plutarch it was all a lot of rot for the gullible. It is said also that the body of Alcmene disappeared, as they were carrying her forth for burial, and a stone was seen lying on the bier instead. In short, many such fables are told by writers who improbably ascribe divinity to the mortal features in human nature, as well as to the divine. In all four gospels the central evidence in common for the resurrection is the missing body of Jesus — the empty tomb. A missing body of a person renowned for a notable life was a well-known piece of evidence that the hero had become immortal and one of the gods. And the angel answered and said unto the women, Fear not ye: for I know that ye seek Jesus, which was crucified. He is not here: for he is risen, as he said. Come, see the place where the Lord lay. And go quickly, and tell his disciples that he is risen from the dead . . .
Peter therefore went forth, and that other disciple, and came to the sepulchre. . . . And he stooping down, and looking in, saw the linen clothes lying; yet went he not in. Then cometh Simon Peter following him, and went into the sepulchre, and seeth the linen clothes lie, And the napkin, that was about his head, not lying with the linen clothes, but wrapped together in a place by itself. Then went in also that other disciple, which came first to the sepulchre, and he saw, and believed. For as yet they knew not the scripture, that he must rise again from the dead. At this pass, then, it is said that one of the patricians, a man of noblest birth, and of the most reputable character, a trusted and intimate friend also of Romulus himself, and one of the colonists from Alba, Julius Proculus by name, went into the forum and solemnly swore by the most sacred emblems before all the people that, as he was travelling on the road, he had seen Romulus coming to meet him, fair and stately to the eye as never before, and arrayed in bright and shining armour. He himself, then, affrighted at the sight, had said: “O King, what possessed thee, or what purpose hadst thou, that thou hast left us patricians a prey to unjust and wicked accusations, and the whole city sorrowing without end at the loss of its father?” Whereupon Romulus had replied: “It was the pleasure of the gods, O Proculus, from whom I came, that I should be with mankind only a short time, and that after founding a city destined to be the greatest on earth for empire and glory, I should dwell again in heaven. So farewell, and tell the Romans that if they practise self-restraint, and add to it valour, they will reach the utmost heights of human power. And I will be your propitious deity, Quirinus.” These things seemed to the Romans worthy of belief, from the character of the man who related them, and from the oath which he had taken; moreover, some influence from heaven also, akin to inspiration, laid hold upon their emotions, for no man contradicted Proculus, but all put aside suspicion and calumny and prayed to Quirinus, and honoured him as a god. For they say that Aristeas died in a fuller’s shop, and that when his friends came to fetch away his body, it had vanished out of sight; and presently certain travellers returning from abroad said they had met Aristeas journeying towards Croton. Both of the above from Plutarch, Life of Romulus. In short, many such fables are told by writers who improbably ascribe divinity to the mortal features in human nature, as well as to the divine. And they rose up the same hour, and returned to Jerusalem, and found the eleven gathered together, and them that were with them, Saying, The Lord is risen indeed, and hath appeared to Simon. And they told what things were done in the way, and how he was known of them in breaking of bread. Compare the following with the Emmaeus Road appearance of Jesus to disciples returning from Jerusalem after thinking their hopes had been dashed. And, behold, two of them went that same day to a village called Emmaus . . . And they talked together of all these things which had happened. And it came to pass, that, while they communed together and reasoned, Jesus himself drew near, and went with them. But their eyes were holden that they should not know him. And he said unto them, What manner of communications are these that ye have one to another, as ye walk, and are sad? And the one of them, whose name was Cleopas, answering said unto him, Art thou only a stranger in Jerusalem, and hast not known the things which are come to pass therein these days? And he said unto them, What things? And they said unto him, Concerning Jesus of Nazareth, which was a prophet mighty in deed and word before God and all the people: And how the chief priests and our rulers delivered him to be condemned to death, and have crucified him. But we trusted that it had been he which should have redeemed Israel: and beside all this, to day is the third day since these things were done. . . . Then he . . . . expounded unto them in all the scriptures the things concerning himself. . . . . And it came to pass, as he sat at meat with them, he took bread, and blessed it, and brake, and gave to them. And their eyes were opened, and they knew him; and he vanished out of their sight. They were no longer able to disbelieve, but rose up and threw themselves on his neck and kissed him . . .
and showed them he was not a ghost, but flesh and blood. Like Jesus, he invited them to touch him to prove this. And as they thus spake, Jesus himself stood in the midst of them, and saith unto them, Peace be unto you. But they were terrified and affrighted, and supposed that they had seen a spirit. And he said unto them, Why are ye troubled? and why do thoughts arise in your hearts? Behold my hands and my feet, that it is I myself: handle me, and see; for a spirit hath not flesh and bones, as ye see me have. And when he had thus spoken, he shewed them his hands and his feet. And the youth replied: “It would seem that he is come to converse with myself alone concerning the tenets which I would not believe. It looks quite mythical when told of Apollonius. How could ancients have seen the tale of Jesus’ appearance to Thomas any differently? But Thomas, one of the twelve, called Didymus, was not with them when Jesus came. The other disciples therefore said unto him, We have seen the Lord. But he said unto them, Except I shall see in his hands the print of the nails, and put my finger into the print of the nails, and thrust my hand into his side, I will not believe. And after eight days again his disciples were within, and Thomas with them: then came Jesus, the doors being shut, and stood in the midst, and said, Peace be unto you. Then saith he to Thomas, reach hither thy finger, and behold my hands; and reach hither thy hand, and thrust it into my side: and be not faithless, but believing. And Thomas answered and said unto him, My Lord and my God. And if it be thy will, receive me too in heaven, as the third mortal. And when Alexander had said this and much more, a mist formed in the air, and a great star appeared, shooting from heaven to the sea, and together with it an eagle, and the statue in Babylon that they said was of Zeus stirred. The star returned back up to heaven, and the eagle followed it too. And when the star was lost from view in the heavens, immediately Alexander sank into eternal sleep. a certain Numerius Atticus, a senator and ex-praetor, . . . swore that he had seen Augustus ascending to heaven after the manner of which tradition tells concerning Proculus and Romulus. There was even an ex-praetor who took oath that he had seen the form of the Emperor, after he had been reduced to ashes, on its way to heaven. But in the night in which the Lord’s day dawned, when the soldiers were safeguarding it two by two in every watch, there was a loud voice in heaven; and they saw that the heavens were opened and that two males who had much radiance had come down from there and come near the sepulcher. . . . and both the young men entered. . . . again they see three males who have come out from the sepulcher, with the two supporting the other one . . . but that of the one being led out by a hand by them going beyond the heavens. As for the loud voice, compare the moment the philosopher Empedocles was taken from this earth in the previous section. The idea that these stories do not smack of mythology is just palpably absurd. Rather than functioning as an argument on behalf of faith, the claim has by now itself become an article of faith, so drastically does it contradict all manner of evidence. Is there a worse example of the fallacy of special pleading, the double standard, than to dismiss all these mythical stories from other ancient religions and to claim that in the sole case of the gospels they are all suddenly true? Laughable in the one case, convincing in the other? There are more links between the gospel resurrection stories and various other myths. The famous example of Pythagoras knowing the exact number of fish being hauled in (Iamblichus’s Life of Pythagoras) and the Pythagorean number of 153 being the number of fish caught at Jesus’ command is one. God, the Army, and PTSD : Is religion an obstacle to treatment? Updated with a new para near the end, Or if we take John 20. . . In response to a few comments on previous posts (Funk’s mix and Cracked argument) I have been giving a few moments to reflect on “embarrassment” as a criterion to establish historicity of a narrative. In Matthew’s gospel, after Jesus has been born of a virgin, performed all his miracles, preached good things, fulfilled prophecy and been crucified and resurrected, he makes one final appearance to his (presumably eleven) remaining disciples. But some of them doubted (Matt. 28:17). Not all of the remaining eleven disciples believed a resurrected Jesus really did appear to them. Some original disciples did not believe that they had ever witnessed Jesus resurrected. That is surely an embarrassing admission for a Christian author to make at the conclusion of his gospel. The admission could do nothing to assist the cause of Christianity. It is a damaging admission. One must therefore assume (if we take the criterion of embarrassment seriously) that this is one of the truest of true facts facing the disciples and church after the death and burial of Jesus. We cannot help but wonder how many is meant by Matthew’s “some”. John’s gospel gives as reason for thinking “some doubters” amounted to as many as four persons. In his last chapter he relates — again with surely stark embarrassment — that the response of the faithful disciples remaining, only seven in total, after supposedly seeing the resurrected Jesus in Jerusalem was to think, “Well, that was an interesting little adventure. Fun and pain while it lasted. But now time to get back to real life and resume fishing.” The resurrected Jesus then appears to these seven. The author refers to this appearance as “the third” one to “his disciples”. Nowhere does the Gospel of John inform readers that the resurrected Jesus actually appeared to all eleven remaining disciples. In chapter 21 John quietly passes over the missing four in silence. So, in summary, if we are taking the “criterion of embarrassment” seriously, here is how the different evangelists responded to the bedrock certain fact that “some” of the original disciples doubted the resurrection of Jesus. Matthew openly admitted it. Most honest of all. Does this mean that some of the disciples Jesus sent out were actually false apostles, even from the original twelve? Presumably so. Mark can be said to be playing with words, leaving readers to make of his narrative what they will. John passes over the failures in silence. But he implies that only seven of the original Twelve were reliable witnesses. This did not stop him from expecting readers to believe his narrative even though four of Jesus’ real life companions appear not to have believed. Luke simply lies and implies they all believed. Well, not quite, maybe. He does say that “they could not believe for joy”, whatever that might mean exactly. Either way, they were all sent out by Jesus to preach in his name. Well, not quite that either. Luke for some reason remains quiet about the activities of all but Peter, James and John after Jesus left the earth. And of Paul’s 500 witnesses to the resurrected Jesus? We are not informed how many of these believed such an appearance was the real thing. Given Matthew’s frankness we should not assume as fact what Paul implies. We do “know” that Paul was quite capable of suppressing uncomfortable details: in his resurrection chapter he hides the fact that the resurrected Jesus first appeared to silly women. A wisdom-pearl in Dennett’s Darwin’s Dangerous Idea reminded me of a host of gossamer arguments regularly touted by fundamenatists (not only Christian or religious fundamentalists, either). Rhetorical questions used to paper over cracked arguments – yes, so often. N.T. Wright is a little more subtle (?) by embedding his rhetorical question in a barrage of rhetorical assertions. Celsus’ critique of the empty tomb story was based on a comparison with pagan claims for the tomb of Jupiter on the isle of Crete (Contra Celsus, Book III, chapter 43). It is worth comparing the billowing rhetoric of these “arguments” with the facts of the text they claim to be supporting. Darrell Bock writes (and N.T. Wright strongly implies) that the resurrection account “relies on the presence of women at its start”. If by “resurrection account” he means the canonical narratives, then it is true that each of these speaks of women being the first at the tomb. But if he means the evidence for the resurrection itself, the women play no direct role at all. The women witnesses are – as per the rhetorical assertions – not believed by the men. In Mark’s gospel, which rightly ends at 16:8, they do not even tell anyone what they had seen. In Matthew’s gospel there is no account of the women reporting anything to the disciples – a strange oversight if the proof of the resurrection “relied” on their witness. Rather, this gospel informs the reader that the tomb guards reported what had happened to the chief priests, and implies that the chief priests believed the account of the resurrection. Next, the disciples themselves witness the resurrected Jesus. By inference the reader understands that Christianity began as a direct result of this appearance of Jesus to the disciples. The story of the women being the first to witness Jesus serves as little more than a nice message to assure the world that the new religion has a special place for women as well as the men. Again according to Luke’s gospel, the women are far from necessary for belief in the resurrection. No-one believes the women (Luke 24:11, 25, 37-38). Jesus has to appear in person to convince the disciples and start the church. Finally in John’s gospel, only one (unnamed) male disciple believes, and he does so only after he sees the empty tomb for himself (John 20:8). In all gospels the apostolic founders of Christianity believed in the ressurrection because they had personally witnessed the resurrected Jesus. In all gospels the women were disbelieved or there is no narrative about their informing the male disciples at all. When I was in Sunday school I learned that the reason Jesus appeared first to women after his resurrection was to offer them some sort of affirmative action or positive discrimination to undo their hitherto subservient place in society. If the women witnesses were not even believed in the story there can be little basis to the assertion that their witness is central to belief in the resurrection as a fact of history. Jesus Seminar co-founder Robert Funk has a lot interesting insights into the gospel texts. But he (along with probably a vast majority of his biblical studies colleagues) also carries a few assumptions that set his historical studies a world apart from the methods of historians of nonbiblical themes. But first the good rule that just about any historian of nonbiblical topics would support. It should be so obvious that it should not even need to be spelled out. Actually Funk does not list that as a “rule” but more as a base awareness before studies begin. From Information Clearing House: Kathy Kelly co-coordinates Voices for Creative Nonviolence, a campaign to end U.S. military and economic warfare, and co-founded Voices in the Wilderness, a group which had openly defied economic sanctions from 1996-2003 by bringing medicines to children and families in Iraq. Two time Nobel Peace Prize nominee Kathy Kelly discusses her experiences in Gaza and Pakistan, and helps evaluate the costs of war-making from the perspective of those who bear the brunt of suffering caused by war. Kathy Kelly co-coordinates Voices for Creative Nonviolence, a campaign to end U.S. military and economic warfare, and co-founded Voices in the Wilderness, a group which had openly defied economic sanctions from 1996-2003 by bringing medicines to children and families in Iraq. So THAT’S why the U.S. was happy to see Kazai win in Afghanistan? According to a report in AKI (Adnkronos International) Kazai’s erstwhile election rival Abdullah was obliged to withdraw from the race when the U.S. swung its full support behind Karzai. That sounds odd given the media publicity at the time over outrageously fraudulent pro-Karzai election officials (some polling booths reporting 100% votes for Karzai, many yielding results in nice round figures, and ghost polling booths etc) — but then one does have to find an explanation for Obama’s quickness to congratulate Karzai on his “win”. But it looks like Abdullah was not the right man to please the Pakistanis or be a useful addition to a scenario where Pakistan needs to find creative ways to remove its internal Taliban threats. So Karzai it was — the AKI report can be read here — Karzai Rival Withdrew Under U.S. Pressure. I love to read fresh insights that potentially open new understandings on how a biblical author worked to produce what became a part of the foundational canon of western civilization. I’ve recently been catching up with New Testament Interpretation Through Rhetorical Criticism by classics professor George A. Kennedy (1984). I have frequently read the view that the Jerusalem Council is a climactic turning point in the book of Acts, but I think this is the first time I have taken note of the view that this episode also constitutes a satisfactory conclusion to a story that began in Acts 1. Kennedy adds some other interesting observations in support. The first of the “we passages” appears soon afterwards, in 16:10. Kennedy notes that scholars generally assume this marks the moment Luke joined Paul, but he himself points out that if this is the case, then it is odd that the author does not say that. Rather, Kennedy finds it interesting that the first “we passage” comes just after the introduction of Timothy as a companion of Paul. While I can readily accept that section of Acts is “a compositional unit”, I think it would be hard to sustain an argument that it was all that was originally intended to be added to Luke’s Gospel. The introduction speaks of the gospel going to all nations and the narrative presages Paul taking the message before kings and rulers. Both these are not fulfilled until the gospel reaches the capital and ruler of all nations (Rome) and till Paul has addressed Jewish and gentile rulers in Caesarea and Rome. But that the narrative up to 15:35 does represent an independent literary unit with a certain completeness in its own right is nonetheless interesting. So when they were dismissed, they came to Antioch: and when they had gathered the multitude together, they delivered the epistle: which when they had read, they rejoiced for the consolation. And Judas and Silas, being prophets also themselves, exhorted the brethren with many words, and confirmed them. And after they had tarried there a space, they were let go in peace from the brethren unto the apostles. Notwithstanding it pleased Silas to abide there still. Paul also and Barnabas continued in Antioch, teaching and preaching the word of the Lord, with many others also. And Paul dwelt two whole years in his own hired house, and received all that came in unto him, preaching the kingdom of God, and teaching those things which concern the Lord Jesus Christ, with all confidence, no man forbidding him. The opening of 15:36 is reminiscent of the opening of Xenophon’s Hellenica, a work read in Greek schools. Xenophon attached his work on Greek history to the abrupt end of Thucydides (probably as left at the latter’s death) by the words meta de tauta, “And after this . . . .” Acts 15:36 begins “And after some days . . . .” An educated audience such as Luke had in mind might have perceived this. I like reading of such fresh possibilities when someone more steeped in the broader literary context of the biblical books than in the confines of theological studies publishes his or her insights. If, as Kennedy notes, Xenophon’s Hellenica was studies in Greek schools, his case is quite plausible. Kennedy comments that although there is no real difference in the prose of the two halves of Acts, there is a significant difference in tone. The second half conveys an immediacy of a first-hand observation. I would qualify Kennedy’s observation by saying that this first-hand impression is itself a rhetorical device and not necessarily a fact of the sources at all. I think that the difference in tone owes more to an additional explanation Kennedy offers — the movement beyond Palestine, Syria and Pisidia and to the Ionian coast, Greece, and beyond. Not much is changed if we do see the author having originally intended for Acts to be a two-part work, or if a rhetorical device at Acts 15:36 served to introduce a new thematic program. What it does offer, however, is an insight to the human processes and plans that were responsible for its creation. Anything that helps us see with sharper clarity the West’s primary canon as a human product is A Good Thing. Ministry of the Apostles. Russian icon by Fyodor Zubov, 1660. This is a continuation from Paul and the Stoics – 1, a look at Troels Engberg-Pedersen’s thesis. The previous post introduced a model which enables us to see the stark similarities of the very structures and foundations of Paul’s theological thought with the Stoic philosophical teachings of his contemporaries. 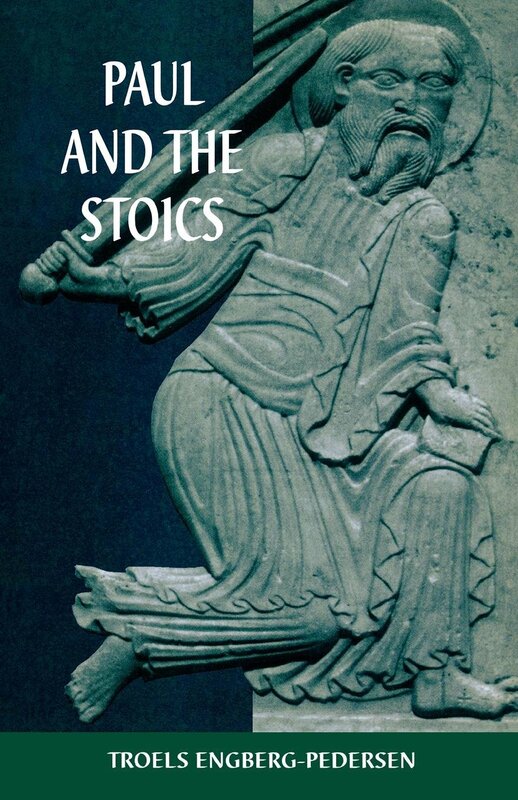 The source of these Stoic (and Pauline) concepts is traceable — not to a Palestinian itinerant or a blinding vision on a road to Damascus — but back to Aristotle. The following synopsis is an overview of what Engberg-Pedersen’s model is all about. My discussion of it comes from me alone and is not part of E-P’s thoughts at all. Details will come in future discussions. Whenever Paul in his letters turns to ethical discussions it is clear that he is intensely engaged in thought about the best form of human living, indeed, about the only right, overall shape of human life and behaviour in the here and now. When he bases his ethical discussions on the foundation of a full knowledge and grasp of Jesus Christ and the gospel, he is attempting to establish a general scheme or structure for the ideal and only right goal (ultimate point – telos) of how to live. To this end Paul was engaged above all with practical thoughts and reasonings that lead to right actions or behaviours. In doing this he is following in the footsteps of the Stoics who in this respect borrowed from Aristotle. Aristotle wrote that the good to which all aspects of one’s life should be directed was something final, perfect, indeed the most perfect thing. This “end” or “purpose” of a human life alone makes one’s life complete and self-sufficient. One reaches “perfection” in the sense of “being complete” and “having reached one’s end or goal” as a result of having lived a life in conformity with right behaviours, and right th0ughts that led to those right behaviours. Aristotle and the later Stoics were strongly focussed on engaging in practical reasonings to understand how particular good acts could all be found to emanate from, and in turn be directed back towards, a single grasp or understanding of the “goal” or “directed end” of one’s life. For Aristotle, this “end” was “happiness”. For the Stoics, it was “reason”. For Paul, it was “Christ”. For Aristotle the “good” that was the “end” of a human life consisted not only of justice (first of all), and moderation, courage, magnanimity, and more, but also of fundamental worldly goods that are needed to sustain life. Note that these qualities include not only “individualistic” virtues, but also “altruistic” ones too. The Stoics modified Aristotle at this point, and excluded those worldly goods from the essence of what was “Good” for a human. The consequence of this was that Stoic philosophy extensively explored the question of how a “good” person was to relate to the material things of the world. But like Aristotle, Stoics also saw a virtuous life as consisting of qualities pertaining alone to an individual (e.g. moderation) as well as qualities that governed a person’s relations with others for the good of others (e.g. justice, magnanimity). Paul clearly reflects the Stoic’s philosophy of ethics here. Intellectual insight is of paramount importance to Aristotle when describing the moral person. For Aristotle, moral insight at the cognitive level is the key to controlling one’s desires and emotions. This intellectual insight is an ability to grasp what one’s life ought to be about and to accordingly understand the right acts one ought to do in order to achieve that end. For Aristotle virtue is a state of mind that may not always be active. But thoughts — right understanding — can activate it and lead to perform right actions and behaviour. Paul’s discussion in Romans 7 about mental conflicts over knowing what to do, knowing “the good”, yet failing to do it despite desiring to do what one intellectually knows to do, follows in the train of the same discussion initiated by Aristotle and developed by the Stoics. a weak-willed person is also of a divided mind, but gives in to their base desires. Much of what is described above may sound like bland truisms to some readers, but that is because we have been immersed in a culture rooted in Christian and Aristotelian traditions. It is the cognitive foundation of Christian ethics and its related view of their place in the world, vis a vis God, other Christians and nonbelievers, that deserves examination and critique. A humanist (and more humane?) ethic, on the other hand, surely must be grounded in an integrated view of the whole person — thoughts and emotions, understanding and feelings. By pitting parts of our nature against other parts, I believe that our cultural and religious traditions have invited mental and emotional dysfunctions and abuses. I do not deny that some have also been led to lead better lives than they would otherwise have done also as a result of this tradition. But the tree needs examination for all the fruit it has borne, the good and the bad. By reading Paul in the context of the ethical philosophical discussions that were part of his heritage one also potentially gains a clearer perspective of the nature of Christianity and its relevance for today. Do we really want to cling to an ethical, anthropological and cosmological system that is in excess of 2000 years old? Have we not made at least some progress morally since then? I am also interested in viewing Paul through this perspective because of what it might well explain about the dichotomy between Paul’s letters and the Gospels. Paul’s Christ is surely a heavenly entity without any ties to this world apart from those of the core gospel message (his incarnation, death and resurrection). Paul’s ethics and Christ derive from reflection, thought, and a philosophical tradition, not from sermons on mounts or ministries of healing. This introduces the overview of what E-P’s model is all about. Details of what happens at each point of the diagram to follow. In Paul and the Stoics (2000) Troels Engberg-Pedersen, building on major scholarly perspectives of Paul, argues for three new ways of understanding Paul’s thought and “theology”. Following Malherbe (Paul and the Popular Philosophers, et al), E-P insists that Paul should not be seen as “against” some Greco-Roman background, but as “being ‘ part of a shared context’: a shared Greco-Roman discourse in which he participated as a Hellenistic Jew.” For E-P this means much more than compiling a stock-take of the points where Paul’s thought compares and contrasts with its religious-historical background. E-P goes much further than Malherbe by arguing that Paul’s overall thought shares the ancient ethical traditions of moral philosophers of his day. E-P describes his approach to Paul as a complement of Meeks’ study in The First Urban Christians. While Meeks interprets discrete ideas of Paul and metaphors he used through the actual community practices in relation to their wider social world, E-P focuses entirely on the discursive — sequential and logically knit — ideas of Paul. These, he believes, tell their own valid story without having to be subsumed under attention to arguments about social practice. Thirdly, E-P embraces the “Paul-was-positive-about-everything-distinctly-Jewish” arguments connected with Sanders and Räisänen. But where S and R see Paul struggling, even psychologically, from letter to letter to work out a consistent argument to accommodate a godly law with the saving power of faith in Christ, E-P, on the other hand, argues that there is far more consistency than S and R realized. This consistency is brought to light when the letters are read with an ancient Stoic’s perspective. So for all of Paul’s apocalyptic and religious terminology, Troels Engberg-Pedersen’s study of Paul’s epistles has concluded that, at core, Paul expresses a message that mirrors what contemporary Stoic philosophers understood as the human situation and the processes required for this to be exalted to an ideal norm. Paul’s Christ, for example, serves the same function as Reason or “Logos” in the Stoic philosophy of Cicero and Seneca. One’s life is ideally to be found “in Reason/Christ”, conforming one’s life to that of the nature of Reason/Christ, with one’s fleshly desires and passions mortified, and in the process being found in a new community (whose polity is from above, not of this earth) of like-minded others. Both Stoicism and Paul’s Christianity are normative. That is, both teach that one’s conduct is to be governed by clearly defined standards. Of course there are differences. Paul’s communities (churches) are more every-day realities than sought-for ideals; Stoic philosophy consistently enjoins compassion for a wider circle of humanity than do Paul’s letters. 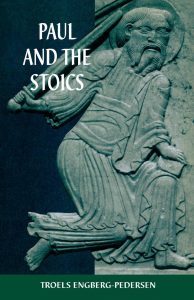 Paul and the Stoics argues that the primary differences do not touch on the common substance underlying both Stoic and Pauline views of human nature and its transformation via a higher agent. The differences very often come down to being matters of expressive metaphors and presentation styles. Paul’s apocalyptic and religious language smokescreens the fact that his thought draws on the repository of Stoic philosophy. For all of Paul’s asserted concern for a time and event that is not yet here, but nonetheless imminent, and for “the Christ event” having initiated the time towards that final event, Paul remains committed and most concerned about the here and now, in particular about the cognitive understandings, self-identities, and behaviour and conduct of individuals and communities in the here and now. E-P calls it the I-X-S model. Keep in mind that I have simplified E-P’s original diagram. I will also be compelled to somewhat simplify the explanation of the model. The I box represents the individual before being converted (to either Stoicism or Christianity). This individual values and follows the basic self-centred desires, such as for food, clothing, pleasure and so on. It does not matter if this individual belongs to whatever other social groups, or even if he or she lives a life of isolation from others, the basic values of this person relate to the person’s bodily needs and interests. The X box represents God, identified as Reason by the Stoics and with (sometimes as) Christ by Paul. When the individual (I) is “struck by” Reason/Christ (X) he attains a cognitive understanding of the nature of X, and responds with a desire to reach towards X. The individual begins to conform one’s values to those of X. This means that he comes to have an “objective” view of himself as a result of seeing himself in the same way X sees him. The individual’s desires and values now conform to those of X. The individual becomes of “one mind” with X. The S box represents the quintessential social community. After the individual is “struck by” and reaches upward towards Reason/Christ, he or she is placed via X into this community of like-minded persons. This community is the one the individual comes to identify with, no matter what other attachments to former communities or groups remain. The individual now has the same values and objective outlook on himself and the world and all others in it. The individual now has the same concern for fellow community members as does X. He/she no longer primarily values her own interests, but the interests of all members equally. The community also reaches up towards X as it continues to seek to identify more with X and the values and mind of X. The I box is placed lowest in the diagram to represent its “far removed from, or far below, the X” state in the cosmology. It is also placed on the left as an indicator that it is a condition that exists prior to its mutual relationship with X and being placed into the X-designated community. Once an I is “in X” and then “in S”, one is “in” these absolutely, completely, as surely as black is black and white is white. In another sense, one is also progressing towards a fuller grasp of X and and a one-ness with S.
That’s enough for one post. Will continue with some specifics in another posting soon-ish.